Prince Harry and Meghan Markle leave after their wedding ceremony at St. George's Chapel in Windsor Castle in Windsor, near London, England, Saturday, May 19, 2018. 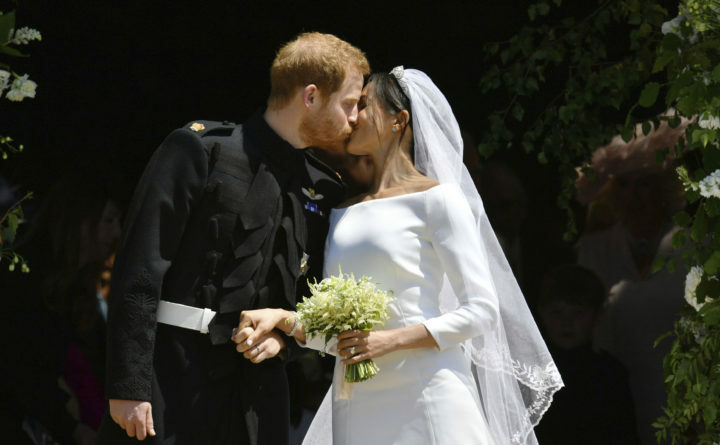 LONDON — Clare Waight Keller of Givenchy is the master British designer behind the sleek silk boat-necked gown and long billowing veil worn by Meghan Markle as she walked down the nave of St. George’s Chapel for her wedding to Prince Harry. The dress featured no lace or embroidery, carrying a classic boat neckline, three-quarter length sleeves and an A-line skirt with a train measuring about 70 inches from the waist. Markle complemented it with a tiara, an embroidered cathedral length veil, a bracelet and a small diamond stud earrings. Markle’s choice was no casual affair. Televised royal weddings like this one have a massive effect on what brides everywhere want to wear and are closely watched across the fashion industry. The forget-me-nots in the bridal bouquet were a nod to the late Princess Diana, Harry’s mother — they were her favorite flower. The myrtle sprigs packed among them were drawn from a pant grown from myrtle used in Elizabeth’s wedding bouquet in 1947. Other flowers were hand-picked by Harry himself from the garden in Kensington Palace. It’s likely one of them will have designed Markle’s second dress for the evening reception being hosted by Prince Charles.